HomeBlogBook on Google (3 of 4): Is Google becoming an OTA? It’s a guaranteed debate with many different views just like when TripAdvisor launched Instant Booking. Back then, at Mirai we said that TripAdvisor had become an OTA, although with many nuances. Book on Google has plenty of similarities with Instant Booking, which could lead us to the same conclusion. However, there are considerable differences that allow us to conclude that Book on Google does not make Google an OTA, although, once again, with many nuances. Because the transaction takes place within Google and this action looks to improve the user experience whilst creating customer loyalty. Because by booking on Google, the client is booking like on any other OTA such as Booking.com. Whoever it connects to “in the background” is not really important. The seal of quality and safety is delivered by Google. Because there is a payment by the hotel to Google for taking part in Google Hotel Ads (a minimum requirement to use Book on Google) and this payment draws Google closer to OTA behaviour, resembling them even more in terms of commission models or CPA, since this is the model used by OTAs. Because the client has the intention of booking on the hotel’s official website and is not aware that he’s starting his booking on Google, as he ends up doing. In other words, there is no strong message to the client saying “Book on Google”, unlike there is with TripAdvisor on Instant Booking. Because Book on Google has no additional cost charged by Google other than the one you are paying for participating in Google Hotel Ads. In other words, there is a cost but for participating in Google Hotel Ads and not for activating Book on Google which will not increment this cost (unless the integrating partner is charging you to use it). Because the after-sales service (changes, cancellations, questions) falls upon the real booking receiver (the hotel itself or another OTA who provided stock and prices). In other words, Google provides the Booking and “forgets about it”. Because the client’s details are fully transferred to the hotel or OTA, who may (and should) try to create customer loyalty with that client, something that Google does not forbid by contract (and yet OTAs do). Because even if you pay Google, it will not appear as a channel in your channel mix. It’s just a sales source but the channel will be another one (your own website or an OTA). Because Google does not interfere in the payment process between the client and the hotel/OTA, transferring this responsibility directly to them. Managing the advance payment for the hotel is a common characteristic of most OTAs except for Booking.com and Expedia Hotel Collects. The direct or indirect nature of Book on Google is perhaps not the most important issue. Whether we like it or not, Book on Google has arrived to stay, so we must get used to its presence and discover the pros and cons of activating it. It’s best to stay up to date with the latest news that emerges and know how to use it to your own advantage rather than having a passive attitude towards it and letting opportunities (and threats) fly by in front of your eyes and do nothing. 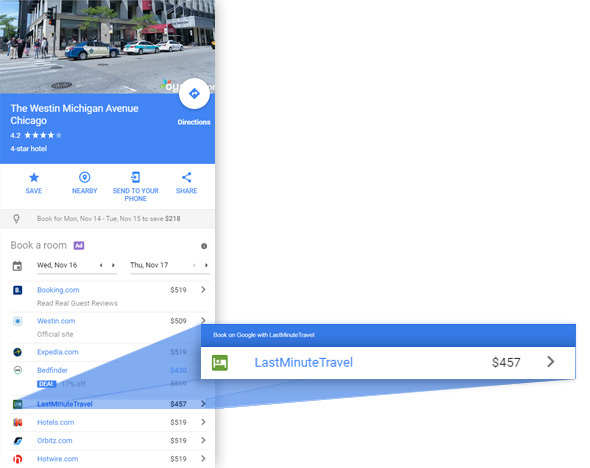 Does anybody know how to get the “on sale” tags on Google Hotel Ad’s OTA price tags? Or the rule of setting? The “on sale” tab is shown by Google when the price is certain threshold (let’s say 15% for example, although not sure about exact numbers) below other channels. You, either OTA or direct channel, cannot control when it’s shown.